With each serving enjoy a large grain-free almond flour muffin made in 90 seconds in your favorite microwave-safe mug or make two muffins in your conventional oven! (Five servings per container.) 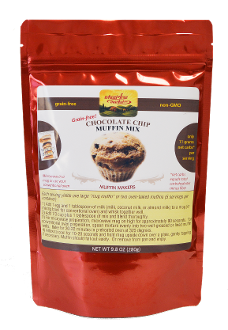 Our Chocolate Chip muffin is made with clean soy-free chocolate chips. The chocolate chips contain sugar, but the base sweetener is erythritol. Be sure to check out the nutrition information for net carbs! Almond Flour, Dark Chocolate Chips (cane sugar, cocoa, cocoa butter), Erythritol, Psyllium Husk Powder, Konjac Powder, Pink Himalayan Salt, Cinnamon, Cream of Tartar, Baking Soda, Vanilla Bean Powder.